Books! 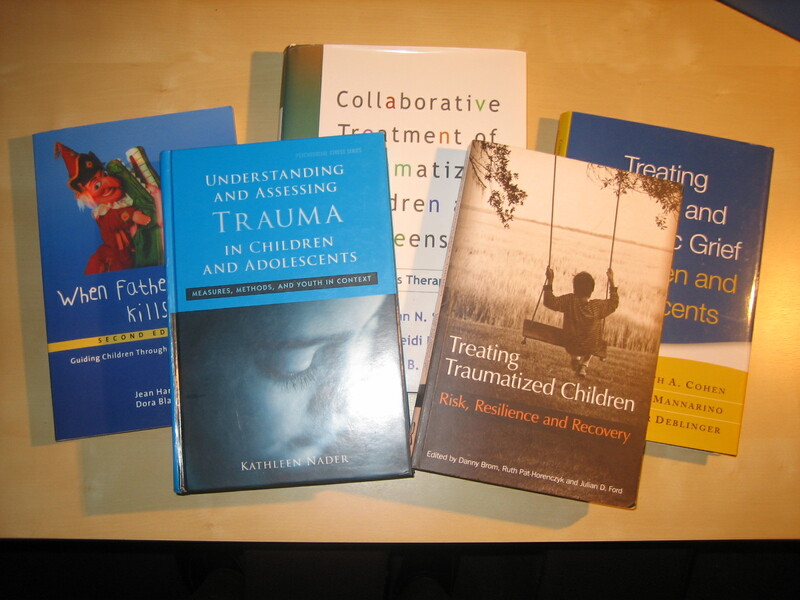 For a Dutch publication on supporting children after trauma, I have read and re-read a number of books on children and traumatic stress in the past couple of months. Five of them clearly stood out as favorites, mainly because of their innovative ideas, child-centered approach, and/or practical examples of how to help children. Here they are, in random order. Would you agree with the selection? Edited by Danny Brom, Ruth Pat-Horenczyk, and Julian Ford (2009). A very rich book with a great collection of chapters on trajectories of recovery, cognitive aspects of resilience in children, and systemic interventions, among others. You need to concentrate to read it but that’s well worth it. Lots of innovative insights and new developments on the edge of theory and practice. By Glenn Saxe, Heidi Ellis, and Julie Kaplow (2008). I’m in love with the TST approach because it’s so child-centered. This book is an easy read, with many examples and exercises for clinicians, as well as information on the underlying theories. The authors understand the complexity of treating children after trauma (e.g., difficulties to engage and retain clients in treatment) and pay attention to ways to deal with it. Their grid of a child’s emotion regulation vs. stability of the social environment, which guides treatment planning, is very valuable in my view. By Judith Cohen, Anthony Mannarino, and Esther Deblinger (2006). A classic. This books explains how to conduct trauma-focused cognitive behavioral therapy with children. It includes theoretical background, structured guidance, scripts, and handouts for clinicians. A complement by the same authors, with more examples of applications, will be coming out this summer. 4. When Father Kills Mother. Guiding Children through Trauma and Grief. By Jean Harris-Hendriks, Dora Black, and Tony Kaplan (2nd ed. 2000). A book on a very specific topic: fatal domestic violence. It is full of good case examples and describes helpful ways to explain terribly difficult situations to children. Some of the statements (e.g., on debriefing) are outdated, but that’s outweighed by the richness and detail of the guidelines on helping children after one parent killed the other. It also discusses the pros and cons of child contact with the parent-perpetrator and of different housing arrangements for children. 5. Understanding and Assessing Trauma in Children and Adolescents. Measures, Methods, and Youth in Context. A comprehensive book, I would almost say ‘encyclopedia’, on the assessment of children after traumatic exposure. It provides an extensive description of the knowledge on traumatic stress in children and adolescents, including the different factors that influence their reactions. Subsequently, it describes a wide range of interviews, self-reports, adult reports, and even projective tests, concluding with a section on writing reports on traumatized youths. This entry was posted in News & conferences and tagged books, children, PTSD, trauma recovery, treatment by Eva Alisic. Bookmark the permalink.